Sadly the set is no longer manufactured either as the Kaito KA1121 or the Degen DE1121 (the actual manufacture version) and has not been in sometime. Near impossible to find one on the used market properly working now. But I must say it’s STILL as close as one can come to from a Swiss army knife portable SW radio even today, so be it a bit weird to operate and understand. 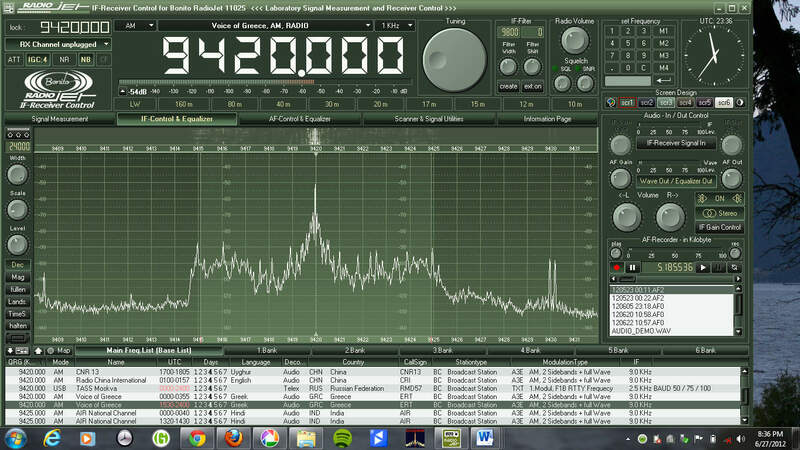 Makes decent off air 128 kbps recordings and in actual MP3 format. Dual conversion, excellent selectivity, 2 bandwidth filters and fairly decent SSB. Dynamic range not too shabby either. Alpha tags on memories that are PC programmable via a formatted text file. Caveats are a very poor reliability record (2 of my test samples over the years have gone to radio heaven / parts), the strange MP3 unit battery (this likes to totally fail, especially if abused) and oh we can’t forget the sticky cabinet syndrome and that has hit all of them by now. In our case we carefully removed this goo with 91% isopropyl alcohol and little elbow grease. We still have 2 in active use at our QTH and “still” love them bugs and all. Thank you, Dave! Yes, the ‘1121 is also a choice radio for many Shortwave Archive contributors. Indeed, one of our contributors has snagged fantastic DX off of her DE1121. Click here to browse her recordings. I created an eBay search for the DE1121/KA1121 some time ago, thinking I would snag one if it popped up. Turns out, you’re right about scarcity, Dave–at the moment, there are only two units, both of which are missing the MP3 bit. Of course, as with anything else on eBay, new units could pop up at any time. 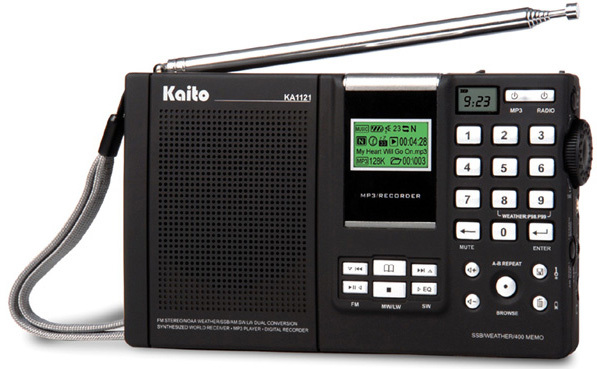 Click here to search eBay for the Kaito KA1121 and Degen DE1121. This entry was posted in Uncategorized and tagged Dave Zantow (N9EWO), Degen DE1121, Kaito KA1121, Shortwave Field Recording, Shortwave Portables, Swiss Army Knife Radios on June 19, 2017 by Thomas. So, the Car Shack idea was good, but I felt constrained by lack of access to better locations to listen to shortwave radio. I took most of the original equipment and stuffed it into a photo backpack I was not using and now I have a portable listening station. Now I can listen in my car or in the field fairly easily. LowePro350AW – The backpack has three main compartments, integrated carry handles, nice padded waist belt, and a couple of ways to stick a 3/4-inch PVC pipe into external tripod or water bottle pouches. My homemade 14-inch loop antenna with Wellbrook amplifier is light enough to be attached to a 3-foot PVC pipe attached to the backpack. The Palstar preselector (active antenna) and KIWA BCB filter are still part of the portable setup. I added a Daiwa two-position switch to cut out the KIWA BCB filter so I can listen to mediumwave. Power for all these devices are Powerex AA’s for the Sony 2010 and two 12V power packs made from three sets of XTAR 14500 lithium batteries + one dummy AA. I have mounted the electronics and wires using large cable tie-wraps to a 14×10 inch polypropylene kitchen cutting board (sturdy and easy to drill through). Here are some recordings from two test outings around 2100-2200 hours UTC. A local county park (“Forest Preserve”) purposely has few man-made structures (just a trail, picnic shelter made of wood and an outhouse). It is about 15 minutes drive from where I live; the reception is notably clear of local noise. There is an occasional wide-band noise that comes and goes but nothing else I can identify as detrimental noise and it is mostly just a nuisance. A big downside of the Forest Preserve, like most parks now, is that it is ONLY open from sunrise to sunset and strictly enforced. So, my personal quest for nighttime access to an RF-quiet location continues (I guess I will have to buy/build my own)! It begs for an even more portable setup than this one. That means buying an SDR (with control via a tablet), miniaturizing the antenna, and modifying the lithium power packs to fit in a very small backpack or fanny pack. If I can miniaturize it enough, I will be able to use common parts of this setup at home, in the car, and at field locations for either mediumwave or shortwave listening. I could then pre-install the unique parts in those situations and just plug-and-play, so-to-speak! It could be that the continuing tech wave of small, powerful, wide-band equipment is causing a revolution in general. A type of radio revival may be at hand where regional radio starts to take a foothold, catering to a multi-state area and not just to one local metro area – with its one-city mindset and control (Do I really care that the Big City is installing a downtown-only, 12 million dollar bike and jogging connection + hearing endless whining about how bankrupt pensions are putting that County at risk when I never go there and don’t care to?). 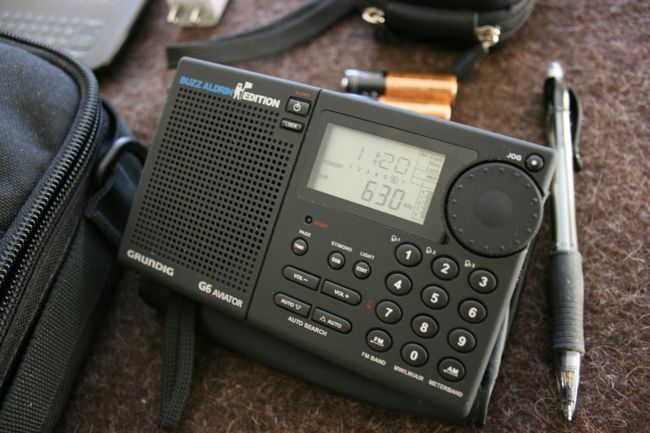 Portable wide-band radios allow for hours of listening to various types of broadcasts! An example could be to use digital broadcasts over longwave (somewhere from 150 kHz-500 kHz) which allows ground wave signals to travel hundreds of miles reliably during the day or night without depending on variable skywave propagation. Digital would enhance the listener experience in stereo. It would probably need a narrower type of digital modulation since the current “HD Radio” standard is really too wide and splatters everything at adjacent frequencies. Pure wishful thinking but the technology is available to make something NEW happen!! Thank you, Tom! You certainly have the right idea: taking your radio to the field! Keep us informed about your progress and updates. 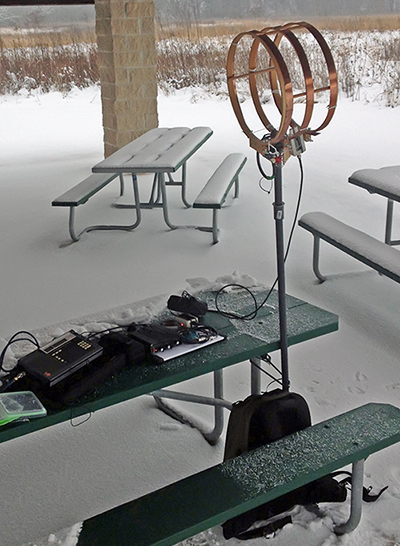 No doubt, over time you will discover a year-round spot to play radio in the field! This entry was posted in News, Portable Radio, Radios, Shortwave Radio and tagged Homebrew Mag Loop Antenna, KIWA Filter, LowePro350AW, Mag Loop Antennas, Palstar, Portable Radio, Portable Shortwave, Shortwave Field Recording, Sony ICF-2010 on December 28, 2016 by Thomas. This article originally appeared in the March 2014 issue of The Spectrum Monitor Magazine. With spring around the corner, my thoughts drift toward the outdoors…and especially, toward travel. Those who know me know that I love travelling, anywhere and everywhere–and that I prefer to travel light, with only one bag. In fact, I can easily live for two weeks out of a convertible shoulderbag/backpack (the Timbuk2 Wingman ) that’s so compact, I can fit it under the the seat of even the smallest, most restrictive aircraft. I never have to check luggage unless the nature of my travel requires extra supplies (I run Ears To Our World, a non-profit that donates radios and other technologies to powerless regions in the developing world). 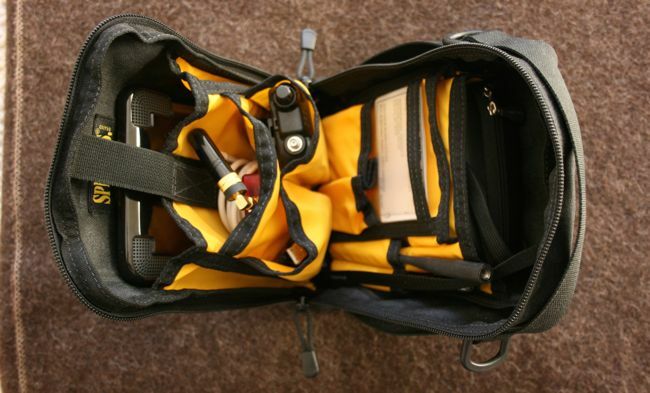 My Timbuk2 Small Wingman is very compact, yet holds everything I need for two weeks (or more!) of travel. So, why not pack everything you could possibly ever want on a journey? 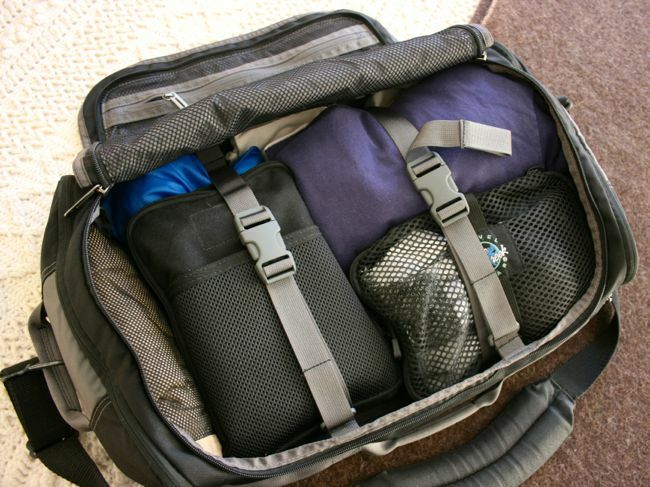 While this remains an option, travelling light has many advantages over the take-it-all traveler’s method. First, it gives one incredible freedom, especially when travelling by air or train. I never have to worry about being among the first to be seated in an aircraft, nor do I worry about my luggage not making a connection when I do. Second, it’s kinder on the back and shoulders, and easier to maneuver wherever I go–no wheels required–whether in a busy first-world airport or bustling third-world street market. Third, I always have my most important gear right there with me. And finally (I must admit) I find light travel to be fun, an entertaining challenge; the looks on friends’ faces when they meet me at the airport to “help” with my luggage is, frankly, priceless. Seeing me hop off a flight with my small shoulder bag, friends ask in bewilderment, “Where’s your stuff?” It’s music to my ears. You would think that having such self-imposed restrictions on travel–carrying a small, light bag–would make it nearly impossible to travel with radio. On the contrary! Radio is requisite, in my book–er, bag. 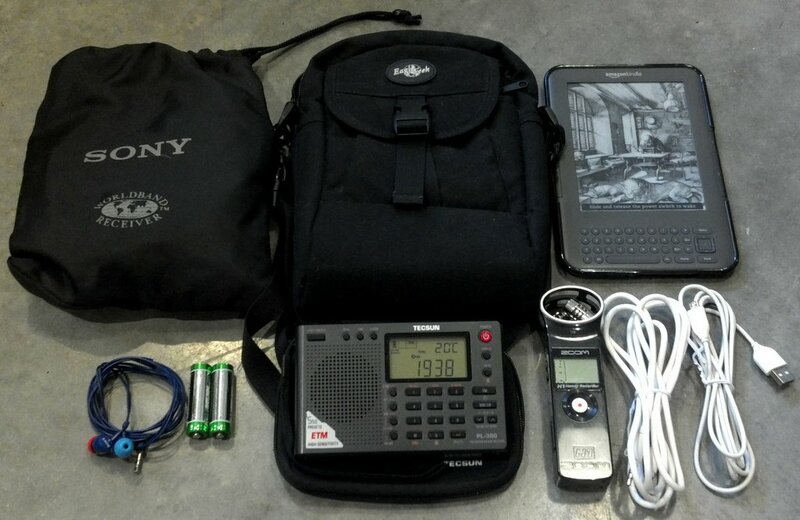 I carry a surprising amount of gear in my small bag: once at an airport security checkpoint, an inspector commented, “It’s like you have the contents of a Radio Shack in here–!” But more significantly, each piece–and radio–is carefully selected to give me the best performance, durability, versatility, and reliability. So what do I look for in a travel radio? Let’s take a closer look. The CountyComm GP5DSP has three different ways of auto tuning stations quickly, an alarm function and the display will even indicate the current temperature. Its unique vertical, thin body might be easier to pack at times, depending on your travel gear. Small size: Naturally, it’s sensible to look for a travel radio that’s small for its receiver class for ease in packing. Overall sturdy chassis: Any travel radio should have a sturdy body case that can withstand the rigors of travel. Built-in Alarm/Sleep Timer functions: While my iPhone works as an alarm, I hate to miss an early flight or connection, so it’s extra security when I can set a back-up alarm. Powered by AA batteries: While the newer lithium ion battery packs are fairly efficient, I still prefer the AA battery standard, which allows me to obtain batteries as needed in most settings; a fresh set of alkaline (or freshly-charged) batteries will power most portables for hours on end. Standard USB charging cable: If I can charge batteries internally, a USB charging cable can simply plug into my smart phone’s USB power adapter or the USB port on my laptop; no extra “wall wart” equals less weight and less annoyance. Single-Side Band: While I rarely listen to SSB broadcasts when traveling, I still like to pack an SSB-capable receiver when travelling for an extended time. External antenna jack: I like to carry a reel-type or clip-on wire external antenna if I plan to spend serious time SWLing. Having a built-in external jack means that the connection is easy, no need to bother with wire and an alligator clip to the telescoping whip. Tuning wheel/knob: Since I spend a lot of time band-scanning while travelling, I prefer a tactile wheel or knob for tuning my travel radio. 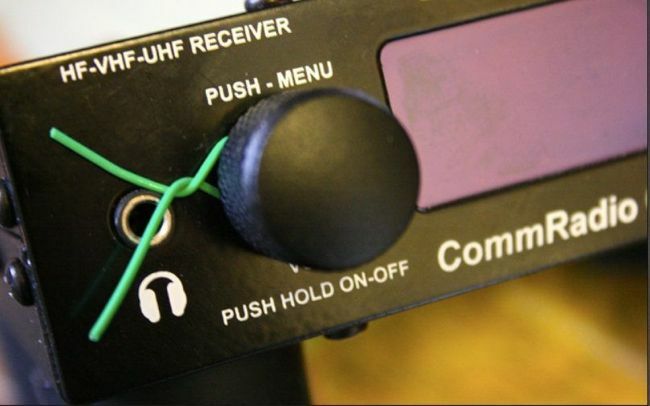 Key lock: Most radios have a key lock to prevent accidentally turning a radio on in transit–but with a travel radio, it’s especially important to have a key lock that can’t be accidentally disengaged. LED flashlight: Few radios have this, but it’s handy to have when travelling. Temperature display: Many DSP-based radios have a built-in thermometer and temperature display; I like this when I travel anytime, but especially when I’m camping. While I don’t have a portable that meets 100% of the above travel radio wish-list, I do have several that score very highly. I also rank my travel radios by size, as sometimes limited space will force me to select a smaller radio. 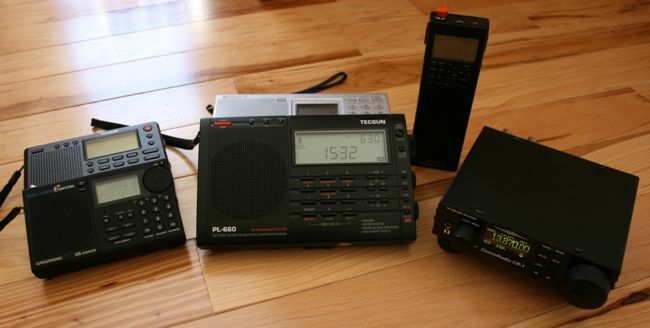 Here are a few of the radios I’ve used and/or evaluated for travel–I’ll break them down by size. Note that all portable radios have alarm/timer functions, unless noted otherwise. I often grab the Tecsun PL-380 for travel. It’s an ultra-portable that truly performs and even has a selection of six AM bandwidths. 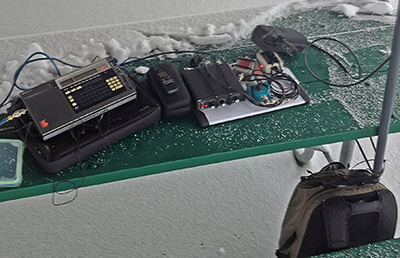 I have also been known to travel with an SDR (software defined radio), especially if travelling to an RF-quiet location where I could make spectrum recordings. While SDRs all require a computer (laptop) to operate, those best suited for travel derive their power from the same USB cable plugged into the PC. Neither of the SDR models below require a power source other than what’s provided by their USB cable. The RadioJet is an excellent travel radio: it’s an excellent performer, über-rugged and is powered by one USB cable. Bonito RadioJet • Pros: Great performance, low noise floor, good audio, flexible graphic interface; • Cons: Windows only, limited bandwidth on IF recordings, no third-party applications (note that the RadioJet is technically an IF receiver). Check out our full review. Seriously? A travel-ready, full-featured tabletop–? Until last year, I would have argued that it was impossible to travel lightly with a full-featured desktop radio in tow. 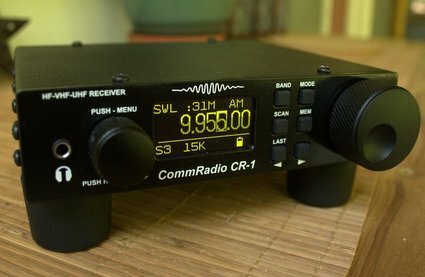 My view changed when I got my hands on the CommRadio CR-1 tabletop SDR. Indeed, other than it being pricey ($600, as compared with $100 portables) this rig is ideally suited to travel! The CR-1 has an array of features–most everything you’d expect from a tabletop radio–and even covers some VHF/UHF frequencies. Its built-in rechargeable battery not only powers it for hours at a time, but meets the strict airline standards for battery safety. The CR-1 can also be powered and charged via a common USB cable. It’s also engineered to be tough and is almost identical in size to the Tecsun PL-880. Though I’ve never needed to do so, you can even remove its resin feet to save still more space. Its only less than travel-friendly feature is the fact that it’s quite possible to accidently power up the CR-1 by bumping the volume button during travel–a problem easily remedied, however, by simply twisting an insulated wire around the stem of the volume knob (see photo). I keep a dedicated “go-bag” with radio and supplies–specifically, the Spec-Ops Brand Pack-Rat –packed and ready to travel, at the drop of a hat. Why? First of all, I know exactly what I’ll be taking, no need to ponder if I have everything. 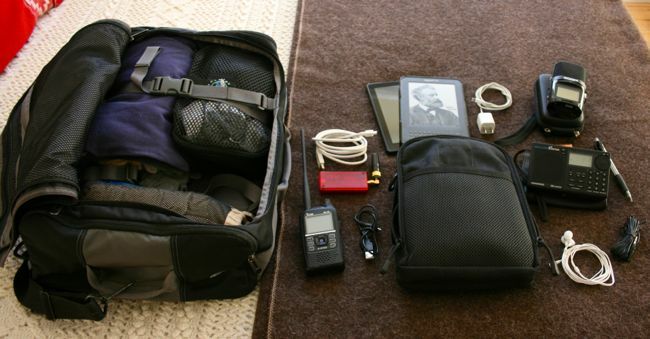 Inside the bag, everything has its place: my portable SW radio, my Android tablet, my D-Star Icon ID-51a HT, DVAP (DV Access Point Dongle), my Zoom H2n Handy Recorder , earphones, charging cables, batteries, small notebook, clip-on wire antenna, etc. If something’s missing, there’s an obvious blank spot in my bag. I also know exactly where and how it fits into my carry-on bag, so if it’s missing, it’s conspicuously missing. 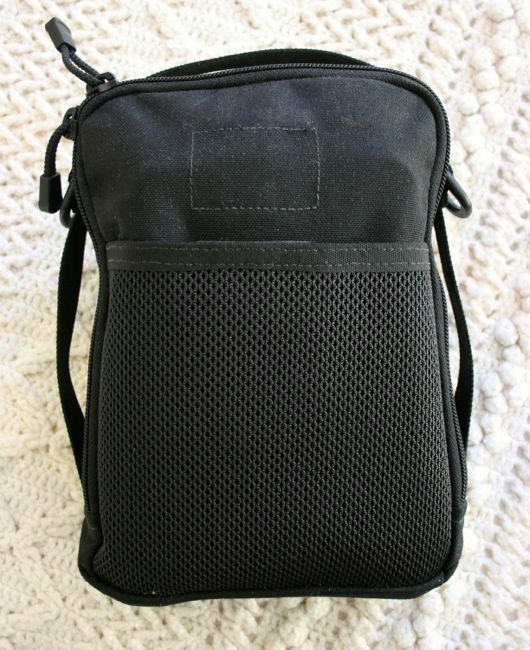 Since I’ve been using this go-bag, I’ve never left anything from my pack behind. Incidentally, this is how I pack the rest of my bag, as well: everything has its place, and any gap will draw my attention to exactly what’s missing. There’s another benefit to having a dedicated go-bag: when flying, before I place my carry-on under the seat in front of me or in an overhead compartment, I can pull the go-bag out of my carry-on and have my Android tablet close at hand with other electronics. As an added bonus, when going through airport security, all of my electronics can be easily removed from my flight bag by taking out just this kit. I’ve had many versions of the Go-Bag over the years, and they’ve all done a great job. What I love about the Spec-Ops Brand Pack-Rat , though, is the fact that it’s military grade–very durable–opens with all of the main storage pockets on the inside, has a bright yellow interior which makes it easy to see the contents (even in the dimness of a night flight), and it’s just the right size to hold my usual travel gear. The Spec-Ops Brand Pack-Rat also carries a lifetime, no-matter-what, guarantee. There are thousands of similar packs on the market, and you may already have one, but you should look for something with multiple storage pockets. Small packs I’ve used in the past that only had one or two main compartments made it easy to leave something out when packing. When I spent a year in France during my undergraduate studies in the early 1990s, shortwave radio was my link with home. I would listen to the VOA–the only source of English I permitted myself to hear–like clockwork, each week. Today, although I travel with a smartphone which can tune in thousands of stations, I always choose to listen to radio. Besides, if the Internet goes down or if–heaven forbid!–your trip takes you into a natural disaster, it’s radio that you will turn to to stay safe and informed. If you take anything away from this reading, I hope it’s that even when you’re presented with travel restrictions, you won’t hesitate to take your hobby, in the form of a portable radio and a few accessories along. It contributes measurably to the fun of travel, as I’ve discovered when I’m able to tune in local and international stations so different from those I hear at home. Or sometimes, it’s just the opposite–it’s the chance to pick up a favorite broadcaster or program while you’re on the road. After all, for me and other travelers like me, the world’s familiar voice is radio. 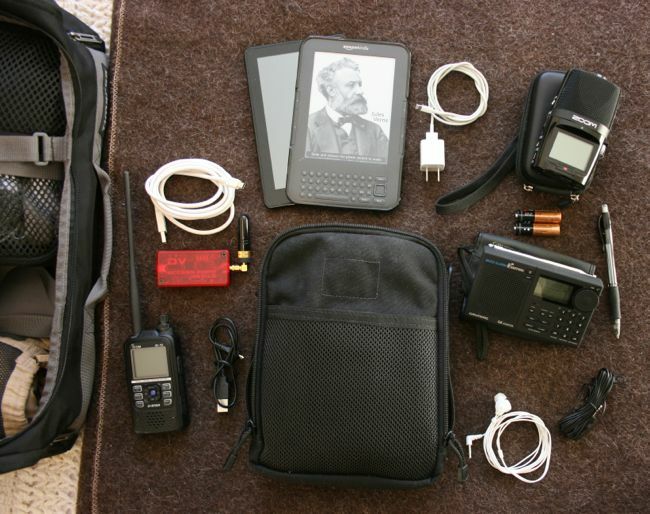 This entry was posted in Articles, News, Radio Gift Guide, Radios, Reviews, Shortwave Radio, Software Defined Radio, Travel and tagged Best Portable Shortwave Radios For Travel, best radios for travel, Best Travel Shortwave Radios Review, Bonito 1102S RadioJet, CommRadio CR-1, CountyComm GP-5DSP, Go Bag, Grundig G6, One Bag Travel, PL-380, Radio Go Bag, RFSpace SDR-IQ, Shortwave Field Recording, Shortwave Radio, Shortwave Radio Review, Shortwave Travel, Spec-Ops, Spec-Ops Pack-Rat review, Tecsun, Tecsun PL-310ET, Tecsun PL-380, Tecsun PL-660, Tecsun PL-880, Travel, Travel Shortwave on April 3, 2014 by Thomas. You should include the Tecsun PL-380 [on] the list. It is an excellent tuner with good selectivity. The ETM feature was made for a traveler. The radio is cheap enough that it won’t bother you if you lose it or break it. I have to say, I agree! In fact, I travel with the PL-380 quite often. 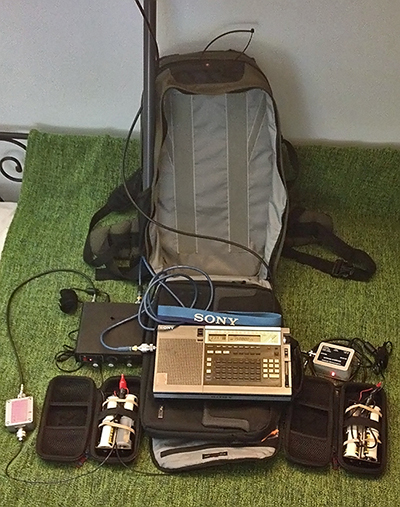 It has become my back-up radio when I make field recordings (my primary portable for field is the Sony ICF-SW7600GR). Eagle Creek pack with contents: Tecsun PL-380, Zoom H1 recorder, earphones, audio cables, external antenna, spare batteries and Kindle. Click to enlarge. active antenna (which I use primarily in hotel rooms with inoperable windows). To help you visualize, check out the photo on the right. It’s my grab-and-go bag. 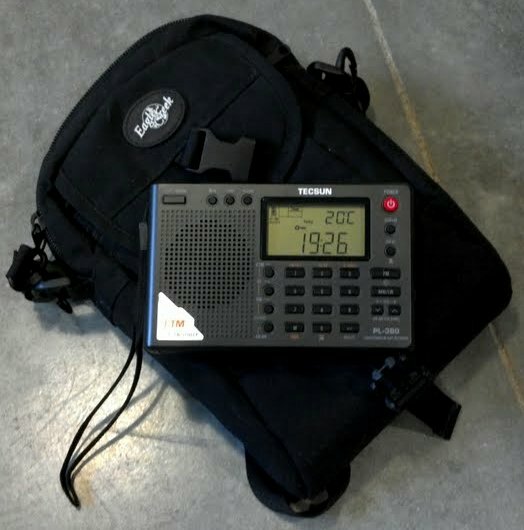 This entry was posted in Articles, Radios, Shortwave Radio, Shortwave Radio Reviews and tagged Best Portable Shortwave Radios For Travel, Best Travel Shortwave Radios Review, PL-380, Shortwave Field Recording, Shortwave Radio, Shortwave Radio Review, Tecsun, Tecsun PL-380 on May 23, 2012 by Thomas.